Throughout the world, amphibians are collected and raised for a variety of uses, including food, pets, medicine, education and research, and fish bait. With the exception of the Chinese and Japanese giant salamanders, Andrias davidianus and Andrias japonicus, the primary form of amphibians used by humans for food is frog legs. Frog legs are extremely popular in Europe, Canada and the United States. In the 1990's, Europe imported 6,000 metric tons of frog legs each year (Jensen and Camp 2003). Between 1981 and 1984, the United States imported more than 6.5 million pounds (3 million kg) of frog meat per year. That is the equivalent of approximately 26 million frogs (Jensen and Camp 2003). 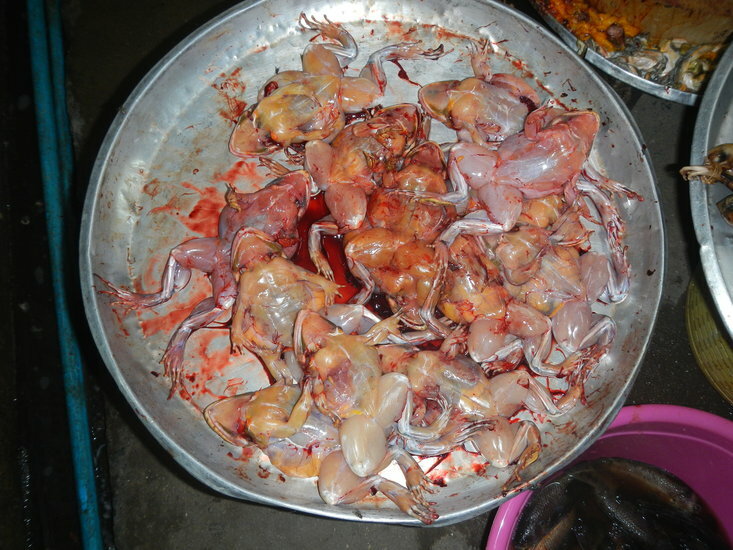 Asia is the second largest market for frog leg consumption, where the most common species consumed is the Chinese Edible Frog, Hoplobatrachus rugulosus (Jensen and Camp 2003). In just one year, over 6 million Chinese Edible Frogs were imported to Hong Kong from Thailand (Wai-Neng Lau et al. 1999). It is presumed that all these frogs are being collected from the wild since most of the frog farms in Thailand only raise American bullfrogs (Wai-Neng Lau et al. 1999). Given the sheer number of frogs collected, this species is likely being overharvested and if this practice continues could wipe out remaining wild populations. Overharvesting has had devastating effects on amphibians in the United States. In the western US, the California red-legged frog, Rana draytonii, began to be exploited for food during the gold rush of 1849 and heavy harvesting continued until the early 1900's (Jennings and Hayes 1985). By the mid-1870's, their numbers had been significantly depleted in the vicinity of San Francisco (Lockington 1879). The overharvesting of this species was driven by a significant commercial demand. Frog legs from California were selling for $4.09/lb in France at the turn of the century. California red-legged frogs are currently listed as federally threatened and are no longer being harvested but their populations are still in trouble. To compensate for diminishing wild populations, people began to farm and also release into the wild American bullfrogs, Rana catesbeiana (Jennings and Hayes 1985). Today, American bullfrogs pose a serious threat to red-legged frog populations (see Introduced Species page). Amphibians have always been popular pets. Children of all ages from all over the world collect tadpoles from nearby ponds and wetlands and bring them home to watch them grow and metamorphose into frogs. However, amphibian husbandry has grown in popularity in recent years and it is no longer just for children. Most amphibians are now bought and sold through the pet trade with people paying high prices for rare and brightly colored species. For example, the Goliath Frog, Conraua goliath is the worldís largest frog, found only in a few swift-moving rivers that wind through a fringe of dense rain forest in coastal sections of Cameroon and Equatorial Guinea in western Africa (Sabater-Pi 1985). The biggest threat to this frog, besides habitat loses, is overexploitation by humans. The novelty of the Goliath frog, being the largest frog in the world, puts a price tag on it as much as $3,000 in America. Because of this, private collectors and zoos have been avidly collecting them since the species was first identified in 1906. They are not currently protected by CITES, so there are almost no restrictions on trade in these animals. Cameroon allows 300 goliath frogs to be exported each year, but luckily they're not easy to find; even the best professional collectors rarely catch more than a few dozen per trip. Brightly colored frogs, such as the Poison or Dart frogs in the family Dendrobatidae, are also threatened by overexploitation for sale in the pet trade. Because of they are brightly colored and have unique courtship and breeding behavior they are highly valued by hobbyists. Yellow-headed Poison Frog Dendrobates leucomelas © 2001 John P. Clare. Lehmann's Frog Dendrobates lehmanni © 2001 Archnokulture. The Blue Poison Frog Dendrobates azureus © 2002 John White. Hong Kong has a large and booming pet trade which involves mostly Chinese and other exotic species. A large amount and variety of salamanders, newts, toads and frogs from all over the world are exported with the main supplying country being the USA. For example, in a single year, South Korea alone exported 34,000 Oriental Fire-bellied Toad (Bombina orientalis) to Hong Kong and several of these toads were then exported to the United States. Hong Kong also exported 9,350 Japanese Fire-bellied Newts (Cynops pyrrhogaster). In their study, Wai-Neng Lau et al. (1999) found protected species such as the Tomato Frog (Dyscophus insularis) and the Hong Kong Newt (Paramesotriton hongkongensis) available in some shops. Similarly, rare species such as the Kweichow Newt (Tylototriton kweichowensis), Tailang Newt (T. tailangensis), and Giant Salamander, (Andrias davidianus), which are protected in China, are being exported through Hong Kong to European countries. How many of you have dissected a frog in either a high school or college biology class? We are guessing that the majority will answer yes to this question seeing as how most state generated standards for introductory biology curricula include the study of the organs of the human body. The low cost and availability of frogs makes them ideal candidates for classroom dissection. The most common frogs dissected are leopard frogs from the Rana pipiens complex and American bullfrogs (R. catesbeiana). In addition to frogs, the mudpuppy (Necturus maculosus) is frequently used in college biology labs. The idea is that the mudpuppy represents a "primitive" tetrapod. Jensen and Camp (2003) surveyed 14 catalogs that sell either leopard frogs or bullfrogs for dissection. They found that only one company (Charles D. Sullivan Company, Nashville, Tennessee) exclusively uses farm raised amphibians. Unfortunately, the majority of suppliers still sell wild-caught frogs. It is hard to determine whether or not the use of amphibians in medicine is having an adverse affect on wild populations. On the contrary, the recent interest in studying the variety of compounds produced by amphibians for their pharmacological potential might have beneficial affects on conservation. The integument of amphibians produce a variety of biologically active compounds (Erspamer 1994). Recently, researchers have identified peptides from the skin of the African clawed frog (Xenopus leavis) and the green tree frog (Litoria caerulea) that show promise as antibiotics (Erspamer 1994). Alkaloids from the skin of certain species, such as Epipedobates sp., a genus of Dendrobatid frogs (Poison dart frogs), have analgesic properties. The skin of plethodontid salamanders harbor microbial floras, some of which have antibacterial and antifungal properties. Amphibians are extremely important in the pharmacopoeia of Asian cultures, where parts of certain amphibians are believed to have medicinal or aphrodisiacal properties. Two common examples of amphibian parts traditionally sold by Chinese medical companies and drug stores are dried oviducts of Rana chensinensis and Bufonid (toad) skin (Jensen and Camp 2003). Several toads, from the genus Bufo produce a toxin from their paratoid glands, bufotenine that has hallucinogenic properties. In addition, the toxin 5-MeO-DMT (5-methoxy-N,N-dimethyltrypamine), is produced by the Sonoran Desert toad or Colorado river toad, Bufo alvarius. Because of this, toads are collected and the toxin is harvested for human consumption. Harvesting the toxin does not require killing the toad, but it is likely that disturbing and collecting these toads from the wild is having adverse affects on populations. The most common amphibians used for bait are ranid frogs, salamanders of the genus Desmognathus and eastern tiger salamanders (Ambystoma tigrinum). Most of the ranid frogs sold in stores for bait are from the wild since most of the frogs raised in farms are destined for biological supply houses or research institutions (Gibbs 1971). During 1998 and 1999, an estimated 250,000 frogs were reported taken from the wild in Minnesota, but it is likely that not all of these frogs were taken for bait (Jensen and Camp 2003). Salamanders in the genus Desmognathus, more commonly known as "spring lizards", are used primarily to catch Centrarchid fish and temperate bass. There are currently no regulations on the collection of these salamanders from the wild so it is difficult to determine how extensive the collection is. A bait shop in northern Georgia reported selling on average 1,400 "spring lizards" per year (Jensen and Camp 2003), but in the wild, these salamanders can be found at densities of up to 14,366 individuals per hectare (Petranka and Murray 2001). So, it is unlikely that the collection of "spring lizards" for bait is having significant affects on wild populations. Larval Eastern Tiger salamander (Ambystoma tigrinum), or more commonly referred to as "waterdogs", are probably the most common amphibian used as bait. Espinoza et al (1970) reported that 2,440,000 "waterdogs" were sold as bait in the Lower Colorado River basin in one year (1968). The problem with the exploitation of this salamander is not the overharvesting of wild populations because in areas where they are collected they are still abundant. Instead, it is the spread of this species that is having adverse affects. In California, introduced populations of the Eastern Tiger salamander are hybridizing with native federally endangered California Tiger salamanders (Ambystoma californiense) endangering the integrity of the California native species. Jennings, M. R., and M. P. Hayes. 1985. Pre-1900 overharvest of California red-legged frogs (Rana aurora draytonii): The inducement for bullfrog (Rana catesbeiana) introduction. Herpetologica 41:94-103. Jensen, J. B., and C. D. Camp. 2003. Human exploitation of amphibians: direct and indirect impacts. Pages 199-213 in R. D. Semlitsch, editor. Amphibian Conservation. Smithsonian Institution, Washington. Lockington, W. N. 1879. Notes on some reptiles and batrachia of the Pacific coast. The American Naturalist 13:780-784. Petranka, J. W., and S. S. Murray. 2001. Effectiveness of removal sampling for determining salamander density and biomass: A case study in an Appalachian streamside community. Journal of Herpetology 35:36-44. Sabater-Pi, J. 1985. Contribution to the biology of the Giant Frog (Conraua goliath, Boulenger). Amphibia-Reptilia 6:143-153. Wai-Neng Lau, M., G. Ades, N. Goodyer, and F-S. Zou. 1999. Wildlife Trade in Southern China including Hong Kong and Macao. in The Biodiversity Working Group: China Council for International Cooperation on Environment and Development, Beijing.